How is the Money BP Pledged to Help Turtles Being Spent? BP is funding recovery of the endangered sea turtles “I think the consensus in the turtle community is that there’s no harm keeping healthy animals safe. That was the emphasis of our request for funding. I think that was by far the most important thing in our mind,” says George. Keep reading How is the Money BP Pledged to Help Turtles Being Spent? Loggerhead sea turtle hatchlings are swimming off into Alabama’s gulf coast again. 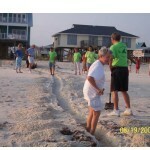 After the BP oil spill, they were moved to FL. Now the water’s safe enough. 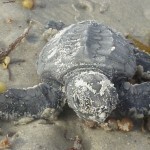 A network of turtle volunteer groups have the data to make decent map of every turtle nest in the gulf, including species and probable hatching time. 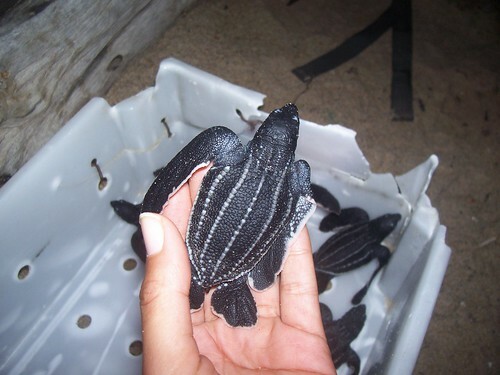 Baby Leatherback Turtle,Courtesy of Jennie – My Travels. Whether you’re an aspiring biologist searching for hands-on experience or just a traveler who wants to watch a few turtles on vacation, See Turtles has an expedition for you, says Brad Nahill, marketing director and co-founder. While the See Turtle website showcases mainly the latter, a kind of turtle tourism lite for those with less time than money, the conservation group is branching out. They now connect longer term volunteers who have more time than money. This is exactly what people are looking for in the age of the Great Recession, animal tourism and voluntourism. Recent college grads, facing 15% unemployment, are willing to take unpaid gigs in a related field. Since posting an application for volunteer opportunities in April, they’ve gotten 500 queries. Wealthier Gen Y grads latching onto the British concept of the Gap Year may be willing to pay thousands of dollars for a resume-boosting international experience. But Nahill hopes to offer the opportunity for a more reasonable fees that go directly to the community, along the lines of $20/day.